What is mobile form design? Mobile form design is the process of creating and implementing a form on your website that’s highly functional and easy to view, complete, and submit while on a mobile device, such as a smartphone or tablet, versus a desktop. Desktop Form Design Today, your website visitors aren’t just browsing your site, viewing your content, and completing your forms from their desktop computers — they’re also completing these tasks from their mobile devices. The design, layout, and functionality of your mobile forms play a large part in your website’s overall user experience due to the number of people who browse items, make purchases, and shop via their mobile devices every day. If your mobile visitors cannot easily read, complete, and submit your form, you may lose their business. If you want to take mobile form design a step further and ensure your entire website is functional on all types of devices, you can implement a responsive website design. Between the size of a mobile device’s screen, the amount of content you need to place in your form, and the number of form fields (form fields are the boxes in which your visitors add their responses), it’s easy to accidentally make your form feel cluttered. Input constraints place a limit on the number of words or characters a person can type into your form field. To achieve this look, use: Simple, easy-to-read typography Minimal form fields Bright and bold action buttons A color palette that doesn’t feel overwhelming Back To You It’s no secret that, today, your website visitors are completing and submitting your web forms via their mobile devices. Otherwise, your forms will be difficult to read, complete, and submit, which may frustrate your leads or cause you to lose their business completely. Think about a time when you were on the train, walking to work, sitting in the airport, or simply laying on the couch, and you had to complete an online form of some kind (an order form, shipping form, survey, etc.) on your smartphone or tablet. Did you have a positive or negative experience? Did the mobile form you completed function properly? Was it easy to read and submit on your mobile screen? 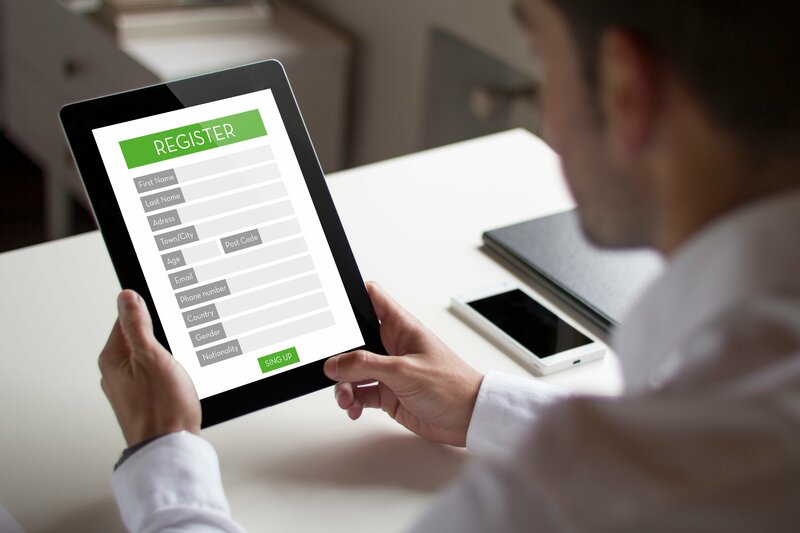 Due to their convenience, as well as the fact that most of us are almost always carrying a device, mobile forms may be something you complete frequently. If the online form you’re completing has a mobile-friendly design, then this process really is a convenient one. However, if the form you’re trying to complete is not mobile friendly, you might quickly become frustrated, angry, or ditch the site completely. In this guide, we’ll review the most effective ways to design your business’s mobile form to help you boost conversions and create a great user experience. There are a variety of ways to achieve this, including obvious action buttons, clear form fields, minimal form fields, automated actions, a beautiful design and layout, and more. But before diving into all of those details, let’s first define mobile form design to better understand the concepts and guidelines we’re about to review. What is mobile form design? Mobile form design is the process of creating and implementing a form on your website that’s highly functional and easy to view, complete, and submit while on a mobile device, such as a smartphone or tablet, versus a desktop. Today, your website visitors aren’t just browsing your site, viewing your content, and completing your forms from their desktop computers — they’re also completing these tasks from their mobile devices. That means it’s absolutely critical for your form to be simple to review, complete, and submit via a mobile device. Why Is Mobile Form Design Important? Great mobile form design allows for a positive user experience which ensures a happy website visitor who’s more likely to convert to a customer and become a returning user. The design, layout, and functionality of your mobile forms play a large part in your website’s overall user experience due to the number of people who browse items, make purchases, and shop via their mobile devices every day. If your forms aren’t mobile-friendly, you may experience fewer conversions, a loss in mobile site traffic, and an increase in unhappy and frustrated customers. And who wants that? Why Should Mobile Form Design Differ From Desktop Design? Think about the difference in the display or screen size between a mobile device, such as an Apple iPhone, which typically ranges from 4.7” to 6.1” in size, and an iMac desktop computer, which typically ranges from 21” to 27” in size. Clearly, it’s safe to assume a form that fits an iPhone screen wouldn’t fit a desktop screen perfectly. If your mobile visitors cannot easily read, complete, and submit your form, you may lose their business. So creating a mobile-friendly form that fits the screen of any mobile device is crucial to creating a great user experience in order to leave a lasting impression on your visitors and help you boost conversions. If you want to take mobile form design a step further and ensure your entire website is functional on all types of devices, you can implement a responsive website design. Responsive web design takes the user’s screen size, platform, orientation, and environment into consideration. This is a simple and effective way to create a great user experience since so many people are constantly visiting and browsing different websites on a variety of devices. There are a number of ways you can make sure your site has a responsive design. For example, if you’re a WordPress user, there are several responsive WordPress themes that you can install and use to design your site. Additionally, if you’re building, or have built, your site with software such as Squarespace, your site may automatically come with responsive web design. Today, responsive web design is a popular choice for businesses due to the sheer number of people visiting websites via a variety of different mobile devices. But for now, let’s get back to discussing mobile form design. When creating a mobile-friendly form, there are some steps you’ll want to take to provide the best user experience possible for your visitors. Let’s review 10 of these UX guidelines that you can begin implementing in your own forms today. Ever heard the saying, “less is more”? Well, that’s exactly what you should be thinking while creating your mobile form. Between the size of a mobile device’s screen, the amount of content you need to place in your form, and the number of form fields (form fields are the boxes in which your visitors add their responses), it’s easy to accidentally make your form feel cluttered. Remember to remove all unnecessary fluff and only keep the form fields for information that you absolutely need.